The product Boundary Line is available through the OS OpenData initiative. OS OpenData is the launch of a specific suite of datasets as part of the drive to increase innovation and support the Government’s ‘Making Public Data Public’ initiative. These datasets can be accessed at no cost and exploited via a very simple set of licensing terms. A new online service allows users to view, develop, download and order the OS OpenData products. The products through the service are updated at regular intervals. Unfortunately, we do not hold the historical data after the updates. The Boundary Line product was updated in May 2011 and thus we no longer have the 2010 data. Hm. I emailed the Boundary Commission about this problem on Monday and I’m still waiting for a reply. Meanwhile, I went to the OS website and got hold of their chunky “Boundary Line mapping product”. *No mention of scale – this is either something the Commission has made up or not explained properly. When you download Boundary Line you might be forgiven for thinking you’re downloading a set of maps, but no, it’s a set of data. So, what am I supposed to do with it? The answer I found, after a bit of digging on the OS website, is “open your GIS”. I know this may be hard to believe, but I’ve never owned a GIS, so I had a hunt around for one. The best one appears to be ArcGIS, but I discovered after I’d downloaded it that my system can’t run it. So I asked the great guys on the Vote UK forum for advice, and they recommended Quantum GIS. Bingo! Er, not so fast. Do you notice something? 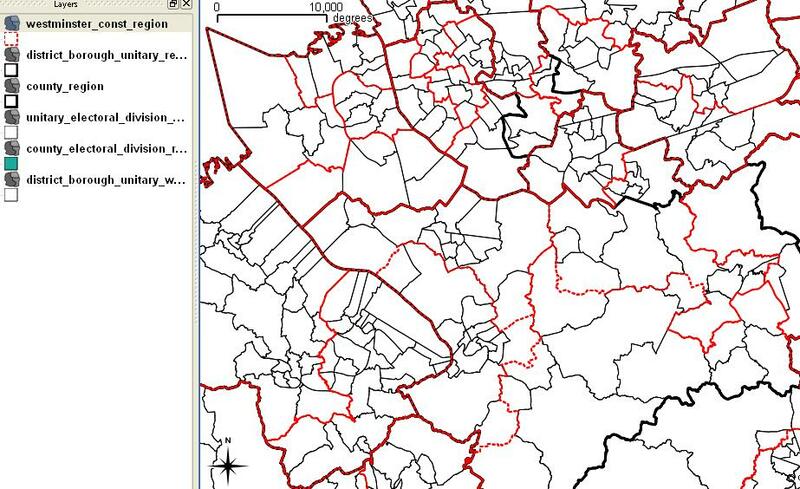 If you’ve been following the story closely, you’ll remember that this is the 2011 version of Boundary Line, so in places like Cheshire where the boundaries changed this year, the boundaries don’t match the ones the Commission has used.